Get ready for a straight shootout as you lock and load the reels of NetEnt's Wild Wild West: The Great Train Heist slot game. Using comic book styling and spaghetti western sounds to bring cowboy characters and major prizes to life, Wild Wild West: The Great Train Heist is a quirky spinner that's perfect for casual players. 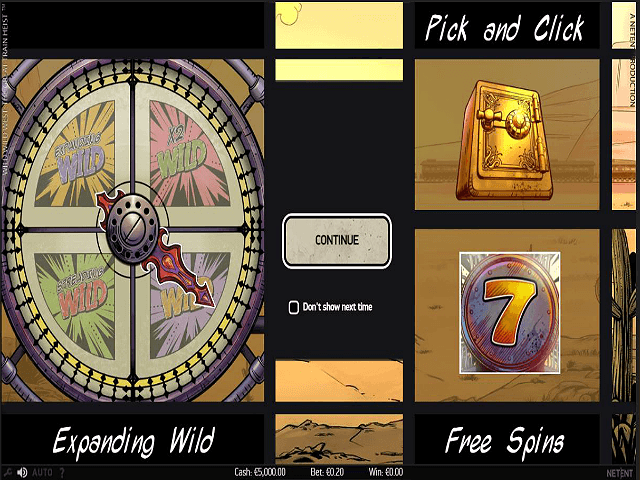 In fact, if you take a few minutes to read through our slot guide, we'll show you how you can become a hotshot spinner and bag a ton of loot to boot. 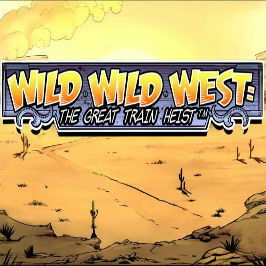 Play Wild Wild West: The Great Train Heist for Real Money! 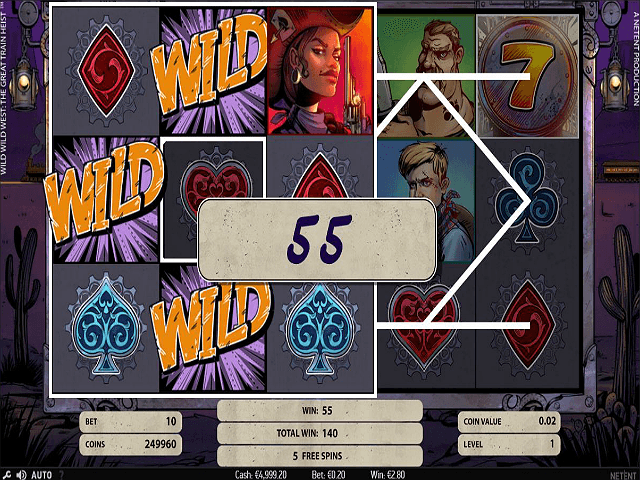 Wild Wild West: The Great Train Heist slot takes comic characters and throws them into western-style shootouts. From the money express train rushing past in the background to the movie-quality music helping to set the scene, everything about this game is designed to be entertaining. In fact, to help you really feel as though you're taking part in Wild Wild West: The Great Train Heist's main story, the spin button is a gun chamber. Instead of a standard button that says "spin" or "bet", the design team at NetEnt has made it look like an empty bullet holder. Naturally, with the chamber being empty, your job is to fill it with bets before you shoot for prizes. In this video slot, you have to choose both the size and the number of bullets you want to fire. In the first instance, you'll have to set your "coin value" between 0.01 and one. After this, you can shift the "level" from one to ten. In simple terms, the "level" refers to the number of coins you're staking on a single win. So, when it comes to firing a few rounds at the Wild Wild West: The Great Train Heist slot machine, your overall stake will be determined by your coin value x your level x ten fixed paylines. For example, if you set the coin value to 0.01 and the level to three, the price per spin would be 0.30 i.e. 0.01 x 3 = 0.03 x 10 paylines = 0.30. Once you've got your head around the Wild Wild West: The Great Train Heist betting system, it's time to fire a few rounds and try to hit some wins. Putting bullet holes in three or more matching symbols will unlock fixed prizes worth between 5x and 500x your line bet. However, because the Wild West is a dangerous place, the development team has given you a few additional ways to win. The first is a selection of wilds. Instead of a single, standard wild, you'll get access to the following when you spin: regular wild, expanding wild, 2x multiplier wild and a spreading wild. 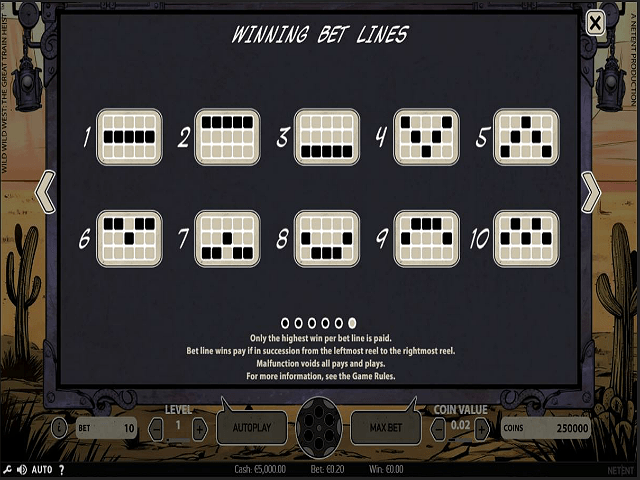 As well as working in various ways to complete winnings combinations, these symbols have top payouts worth up to 500x your line bet when you match three or more. Beyond these special symbols, the 7 scatter is on hand to unlock a free spins bonus. Three scatters are worth ten free spins, while four and five scatters will earn you 20 and 30 free spins respectively. Finally, to add some more firepower to your arsenal, there's a pick'em bonus round where you can uncover mystery boxes in return for cash prizes worth between 5x and 50x your entire bet. Guns drawn? It's time to jump aboard The Great Train Heist. Share this Wild Wild West: The Great Train Heist Review today! 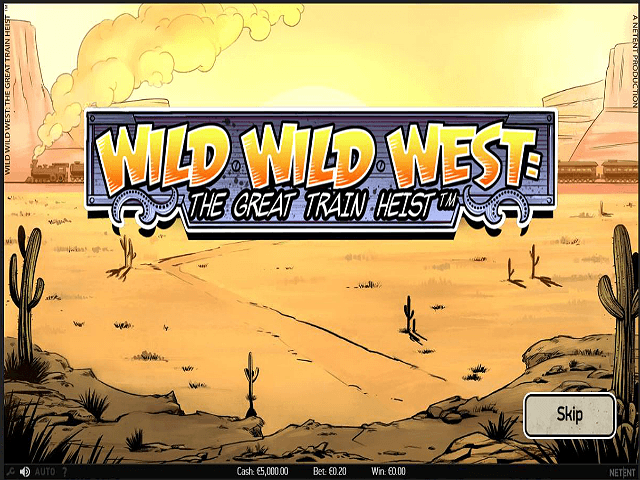 If you like Wild Wild West: The Great Train Heist, you'll love these slot titles too!